What really matters: Why BJP is making it Modi Vs. Kejriwal? 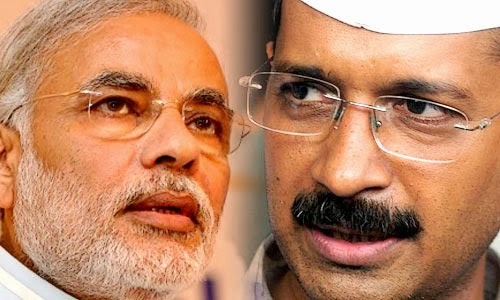 Why BJP is making it Modi Vs. Kejriwal? The rise of Kejriwal has definitely not gone well with other politicians. It's just like a yesterday's intern in a company gets into the board of directors within no time, how can it be digested by far experienced employees of that organisation? But that does not give these politicians the licence to pull his legs like they do with one another! The way +Bharatiya Janata Party(BJP) has come out against +Aam Aadmi Party(AAP) is surprising! Why BJP is getting the momentum it presently enjoy is because of two things. Firstly, because of the infamous image that the ruling +Indian National Congress has earned over the last decade of it's governance, most of which coming in the latter and more recent part of the rule. This is probably way too much for the Nation to digest or forget. Even the Vedas say, अति सर्वत्र वर्जयेत् which means 'excess of everything is bad'. Perhaps, they have reached to those heights from where 'aam aadmi' cannot be seen. Secondly, it was because of the emergence of the iconic leaders such as +Narendra Modi. This person has enhanced the image of his party to an extent which is beyond the wildest imagination of Congress Party. Riding on these two horses, BJP has stormed the Assembly elections leaving Congress lost in the mud beyond recognition. The picture is all very rosey for the BJP till we talk about the man of the moment, Arvind Kejriwal; the mention of whom brings the devil out of the 'Ram-bhakts'. Almost all the leaders of state level BJP party that definitely includes faces like Vijay Jolly and even Chief Ministerial candidate Dr. Harsh Vardhan are coming out openly to criticise AAP and Kejriwal. If we take a step back and think why people have voted for BJP, one reason that will overshadow all others will be the love of the people for the Nation. People want to see India progressing and the evils like corruption and bad governance be rooted out entirely. A party like BJP has shown some promise by its good governance in few states like Gujarat & Madhya Pradesh and through the emergence of few iconic leaders. Coupled with the failures of UPA, this change was inevitable. But similarly, a new sun has appeared at the political horizon of the country. With the dramatic rise of Aam Aadmi Party in state surrounding the National Capital, new pages are added to the books of history. The story of the emergence of AAP from it's inception to reality is so dramatic that it can give even bestselling works of fiction run for their money. If we talk about the reason of the success of AAP, we will see that it is not much different from the reason of the success of BJP. One of which is the failure of the present Government and other is the vision of a better Nation and a better Governance. More than these political issues, a common nation loving individual would like these parties because of the care for the Nation shown by their popular leaders. You look at Arvind Kejriwal and Narendra Modi, they are loved because people believe that they love the Nation more than anything else. Same cannot be claimed about Manmohan Singh or Rahul Gandhi, who seems more worried for their party. But the question remains, why the decision makes in BJP cannot see this? Why are they criticising a party which is voted in because of an ideology which is similar to the one their Prime Ministerial candidate propagates? The common man of India who has voted-in BJP with an overwhelming majority in Rajasthan and Madhya Pradesh only feels proud when he hear about the rise of Arvind Kejriwal in the National Political scenario; a feeling that BJP spokespersons in the media do not share! Even Narendra Modi, who is so much vocal about Rahul Gandhi has not spoken even a single word against Kejriwal yet! Perhaps his team is still trying to analyse whether it will do more harm than good for his campaign. Take a clue!